Remember the popular add slogan from Gatorade, “Is it in you?” The visual was effective – what you put in will eventually come out. A cool graphic, and man, how true. I was sitting listening to my pastor this morning and he made the comment that even in church, we all still wear masks sometimes. That also rang true. It’s not until I’m squeezed, until the pressure is on, then what’s really inside me comes out. When the heat is on, that’s when you find out who I am, what I’m made of, what I’ve been “feeding.” Wow, how many time’s I’ve blown it, big time. Thankfully, as I heard Chip Ingram say on a parenting video this morning, “failure is never final with God.” Whew! 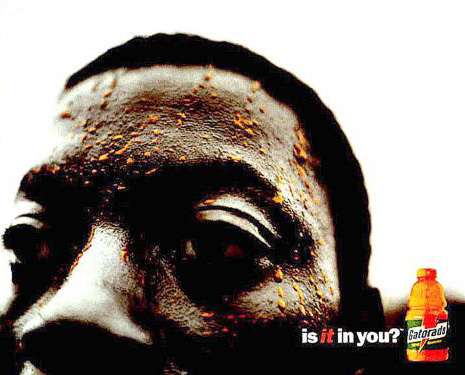 So Gatorade is fine for fitness, but it’s not going to get me through life. It’s not “what’s” inside that matters most, but “who” is inside. A good reminder that my focus needs to be on “being transformed into his image.” Praying to be more like Christ on the inside, so that’s what people see on the outside when life squeezes me again! Scandal, performance enhancement, & blood manipulation: Is blood really the secret to finishing well? Cycling news has been littered with scandal lately. Unless you’ve been on an island, it has been hard to miss the media firestorm surrounding the Lance Armstrong case. The USADA has spent weeks laying out a case highlighting illegal performance enhancing drug use and elaborate blood doping schemes among the top professionals. We have now witnessed public apologies, admissions of guilt, firings and sanctions along with confessions of “win at all cost” mentalities, and so on. No matter how much you believe about who did what, when, and why, it is clear that the world of cycling is, to use a technical term, in a big whopping mess. As I read through the stories and testimonies, I’m amazed at the lengths to which some have been willing to go (and at great risk to personal health) to get to the top. The thought of any type of blood doping sounds like a terrifying prospect to me – but I’ve never been a big fan of needles either. So what is blood doping/manipulation and why do it? To put it simply, our muscles need oxygen to perform. When oxygen is depleted, we get tired. But what if there was a way for our body to produce more red blood cells, which are those cells tasked with carrying oxygen to our muscles? There are two main ways (that we know of) that athletes can try to cheat the system that involve blood. One way is to introduce a drug (EPO) into the blood stream which can stimulate the body to produce more red blood cells. A second method is for an athlete to have their own blood drawn and then frozen for use later. Once the body replaces the lost blood, the frozen blood can be taken out of storage, thawed, and put back into the system, thus increasing the volume of blood and number of red blood cells (and in my mind making blood the consistency of thick maple syrup). This seems to be the harder method to detect since there are not any drugs directly involved. In either case, the methods are considered illegal, and are very dangerous. It is evident though that some will attempt to win no matter what the risk. Now, winning is not inherently a bad thing – I think we probably all like to win, (I do – just play a board game with me sometime) but it should never be at “all cost.” It is also important for us to remember that “winning” is not always synonymous with “finishing well.” There is a difference. Although many of the accused and admitted dopers technically “won” their event by crossing the line first, it is now clear to all that they did not finish well. So what does it mean to finish well? What does it look like? The writer of the book of Hebrews offers valuable insight by painting a vivid picture of true success, using of all things, a racing analogy. 1. The Stadium (race course): Unlike our oval shaped modern stadiums, the typical Greek arena was rectangular, with a length of roughly 660 Greek feet. It had an opening at one end, and a “goal” at the other. 3. The Herald: The herald had an important job. At the beginning of a race, it was his duty to announce the name and home country of each competitor. At the end of a race, this information would be repeated for the victor, with the name of the victor’s father would also be announced. 4. The Judge: Presiding over the games, it was the right of this individual to award the prizes at the end of the game. 5. The Prize: Typically this was a wreath or garland, worn like a crown, made from various types of plant branches. Yes, it might seem strange to us to get all worked up for the honor of wearing a plant on your head, but that’s how they did it. Some of the various plants had different symbolic meanings. One plant was even believed to convey mythical powers to the athlete when worn as the victor’s crown. Look around though (Kona anyone? ), the tradition of a victory crown is still carried on by many today. And now, off to the races!!! The writer of Hebrews describes a great “cloud” of witnesses. When I read this, my mind quickly races to the old cartoons with angels floating on clouds playing harps. That however is not what is in play here. The term “cloud” can simply refer to a large number or mass of people. Since this passage uses a sports analogy, let’s look at it from that perspective. In the previous chapter, the writer had just given us a long list of heroes of the faith, those who had not lived to see the promises of Scripture fulfilled in Jesus, but nevertheless were faithful and died holding on to that hope. I see the picture here as one of the saints of old gathered around the arena of our lives, not literally as if they are all gathered together on a celestial seat cushion, and not as spectators, but as encouragers (witnesses) to us by way of the faithful lives they conducted while still living. It may be a strange metaphor, but I think of their lives as the “cowbells” of faith – a loud reminder clanging in our ears to spur us on to faithfulness. Historically, one thing that made Greek culture controversial was its very differing views on modesty (or lack thereof) – in other words, a runner might not wear any clothes. This is not at all what the writer is suggesting, but the more literal translation of the verse points to laying down any “weight” that hinders. Try running with a full pack sometime! Even today, we run in the least constrictive clothes possible so nothing extraneous slows us down from reaching our destination. The point is the same – get streamlined and dump the things that weigh you down (which certainly includes sin, but sometimes good things as well) so you aren’t deterred form your goal. How are we to run? “With perseverance.” We are not just running for running’s sake, but we run in a certain way. The letter to the Hebrews was one addressed to a group of Christians who had undergone persecution. The Greek word we translate as “persevere” is actually a strengthened form of the word for “abide.” Meaning more than simply to “stay,” or “remain,” it carries the idea bearing up under a trial courageously through the suffering. This was a strong word of encouragement for those Jewish Christians who at the time were being tempted to turn away from their newfound freedom in Christ. What is our goal? First century racers saw a rectangular pillar before them, a fixed point, so they new where the finish line was and could run full force towards it. Have you ever run a race without knowing the course map or where the finish line was? An aimless and anxiety inducing proposition for sure. In a sense, you would run aimlessly. We might be in a big hurry, but without any real idea of where we were going. But we look to Christ, his life, the hope he offers, his example in the face of suffering, and the indwelling power of the Holy Spirit within those who belong to him, as that pillar is transformed into a cross. What did he endure? The sinless Son of God suffered separation from God the Father, something he had never known, the wrath of God that was rightfully ours, and excruciating physical pain on the cross, all that we might be saved and brought into a relationship with God. To say it was hard is not enough, as we cannot fully comprehend his suffering, but he was willing to endure it for the joy to come, paying a price for us that we could never pay ourselves. Paul wrote in his letter to the Philippians, “Not that I have already obtained all this, or have already arrived at my goal, but I press on to take hold of that for which Christ Jesus took hold of me. Brothers and sisters, I do not consider myself yet to have taken hold of it. But one thing I do: Forgetting what is behind and straining toward what is ahead, I press on toward the goal to win the prize for which God has called me heavenward in Christ Jesus.” (Philippians 3:12-14) Paul clearly saw the prize for what it is, and it is the same one we are to pursue today. One day our race will be done and the Judge will make his pronouncement. When those of us who know Christ one day cross the final finish line and receive the victor’s crown, there is one thing we will want to hear. It is not something as mundane as our place in a race, or even the phrase, “you are an Ironman!” No, we will want to hear, “well done good and faithful servant!” That is when we will know we have finished well. And to the question, “does it really take blood to succeed? Over one hundred years ago, Lewis E. Jones penned a now famous hymn with the refrains, “There’s power in the blood, power in the blood….wonder working power….” So the answer to that question is a simple and emphatic “YES”, it does take blood to succeed. The secret is that the blood required is not our own. While looking for some running tips I found this clip on YouTube. A well put together video with some real application! My best? I was shooting for mediocre!!! Thanks to elite triathlete Kimberley Westbury for the pic! I always tell my kids, “just try your best!” So I was recently confronted with a great philosophical dilemma, can you try your best to not do your best? No, I’m not sandbagging. To be upfront, I’m not a guy who is accustomed to being on the podium. I’ve been there once, in six seasons, and it was in a duathlon (with a very small field.) So no, this is not a veiled attempt to explain a poor performance (I’ll be more blatant with those). This was just one brain twister of a race. The super short background – I pulled/strained a hamstring during a training run several weeks ago, and since then have struggled to eek out even a short run. The week before my race, after seeing my sports therapist, I was able to muster a pain free 15 minute run. Anything more than that and the back of my leg turned to stone. This race required a brand new strategy – I knew I could not feed my normal delusions. The main one being that despite my lack of training hours or genetic giftedness, I would somehow, someway, find my way onto the podium this time. Is that “Eye of the Tiger” I hear playing in the background? Although it pretty much never pans out that way, it does motivate me! My other goal, somewhat more realistic, it to try to set a new PR each year at the races I repeat. Still, the point of this goal is probably to feed yet another delusion – I’m not really getting older. Anyway, the race. Wetsuit legal, so a good thing for me. Since rubber floats I would not have to kick much which would save my legs for at least 1/3 of the event. I jumped in the lake for a warm-up swim and felt surprisingly good. So good that I started to think about maybe just having a PR in the swim this time ;-). I am a decent swimmer as far as triathletes go, usually finishing near the top of the swim for my age group. The start horn sounded, and off I go right in the front of the pack! About 5 strokes in I feel something around my ankle! Ugh, my timing chip was about to fall off. Not wanting to plunk out $35 to the race director for a replacement (cheap, remember? ), or practice my diving skills in Lake Hartwell, I decided to just roll over and fix it. I did so, and at that exact moment remembered I was still at the front of the pack. I was greeted immediately by about 1000 flailing arms all ready to pound me into the lake. Brilliant. I’m not sure how I managed to duck out of that one, but after a lot of fiddling around I finally got it tucked under the leg of my wetsuit and off I went again. After spending the swim playing catchup, it was time for the bike. I LOVE the bike. I also like climbing hills on my bike, but no, no, not today. I was going to be a very good boy. My legs were already starting to feel tight and I was just getting started. At every hill I could feel them tense up, on the verge of cramping. I was still nice and consistent on the flats, but I just sat back and watched everyone pass me on the hills. I think a kid on a big wheel might have passed me once. A mentally painful ride. Finally it was time for the run. Any hopes for a PR were gone like last nights leftover pizza, so all I had to do was survive. Survive I did. It was not until the finishing chute that I met my greatest challenge. Someone was coming up behind me. People were shouting, “don’t let him pass you!” It was a college student in his first race, and eager to pass anyone. It wouldn’t affect my age group placement, it wouldn’t affect my finish time. BUT MY EGO, MY EGO WAS IN DANGER. I only needed to sprint for about 20 feet. There was plenty in the tank, and I could come close to doubling my speed. AND AT THE VERY LAST SECOND….I just let him pass me. That was very hard. But smart I think, because I risked locking up or further injuring my hamstring and really putting myself out of commission. I would have to say it was a good race. I loved spending time with my triathlon buddies and making new acquaintances. God was very good to me, and let me finish without further injury, or real pain. And I learned a good lesson about priorities and not getting caught up in the heat of the moment. I sacrificed some temporary satisfaction at the finish line, hopefully in return for some greater rewards later on. I think there are some life lessons in that. Sacrifice is a discipline I could always use practice with. Now, is that “Eye of the Tiger” I hear in the background? HEY! WIN COOL FREE STUFF!!! I’ll make this relatively quick. Humans have a short memory. I know I do. I forget my car keys, whether or not I turned off the iron, and far too often, I forget how much God has done for me. I wont list all my life struggles here, but my most recent one has been physical. Nothing earth shattering, but disturbing to me none the less. I have a disc injury, (that’s a back thing for all us non-medical folks) and for someone who likes to be active, that can be maddening. I’ve marked some major milestones in my thirties: I started cycling as an early thirty-something, later completed my first half-iron man. Crossing the mid-point of my thirties I ascended Mt. Ventoux in France and completed an Ironman, and now today I’m celebrating becuase I was simply able to run one mile non-stop. No, this is not a pity party, I’m confident that my back will improve. Hopefully I’m still learning important lessons though. I’m not a stranger to injury – broken collar bone, hand, arm (twice actually), multiple twists and sprains,overuse injuries, hernia – you get the point. None of these are on the scale of what many go through medically, no attempts at comparison are being made here, again not the point. I am reminded of a couple of verses in the Bible, which really don’t speak specifically to my situation, and yet which have for some reason really stuck with me. The first is “After all, no one ever hated his own body, but he feeds and cares for it, just as Christ does the church.” (Ephesians 5:29) The second is this: ” Skin for skin! Satan replied. “A man will give all he has for his own life. But stretch out your hand and strike his flesh and bones, and he will surely curse you to your face.” (Job 1:4) The first is from the writings of Paul, written in the context of how husbands should love their wives as Christ loves the church. The second is from the book of Job and records Satan’s suggestion about what he thinks will cause Job to curse God. You won’t find anything about disc injuries or sports injuries in either. So what IS the point? Never are we so keenly aware of our mortality,the frailty of human existence, as when our bodies are hurting. Although we might sometimes deny it, we are pretty attached to our bodies. That’s how we are wired. I have “leftovers” from old injuries, things I sometimes lament (I’m ashamed to say). So how can those things be used to bring God glory? Can they even be used for my encouragement as well? Some of the things I read in the Old Testament often strike me strange, because they are so culturally foreign to me. I see people setting up pillars, or piles of stones to commemorate events, encounters with God. How easily we forget things without reminders. A couple of years ago I was told by a cardiologist that he had detected a site of prior disease in my heart. I forgot about running, and wondered how many years I would have with my family. We cried out to God. Subsequent tests revealed, according to my doctor, “one of the healthiest examples of a human heart he had ever seen.” God did that. I give him full credit. For weeks I would thank God regularly, and praise him as I ran… but how quickly we forget, and how much we take for granted. Fast forward to today. As I went for my very short run today, I hoped with each step the pain would not creep in. At one point, with each stride I found myself asking God for his help and healing. I was reminded that I am utterly dependent on God for EVERY STEP. Take it as a metaphor if you like. Not only every literal step of my run, but every aspect of life. It is so easy to delude oneself into believing in our own self-sufficiency, that we are the sole captain of our ship and commander of our life. Then a reminder will creep in, that nagging little twinge, that ache, that reminds me I’m only flesh and bone, and thankfully not alone. So I’ll own my injuries as long as they persist, and use them as a pillar, a reminder in my flesh, which points me to the true captain of my ship, the commander of my soul, and the ultimate source of life, Jesus my Lord and Savior.